When Death comes for the children's beloved grandmother, they try to keep him from his task by serving him enough coffee to distract him until dawn, when he would have to leave without their grandmother. Though "Some people say Death's heart is as dead and black as a piece of coal...that is not true. Beneath his inky cloak, Death's heart is as red as the most beautiful sunset and beats with a great love of life." So Death tells the children a story about two brothers, Sorrow and Grief, who wind up marrying two sisters, Joy and Delight. After a long life together, all four died on the very same day, because they couldn't live without each other. Death uses this fable to show children that life needs both light and darkness. And his last advice, after the Grandmother dies, is the title of the book: "Cry, heart, but never break. Let your tears of grief and sadness help begin new life." 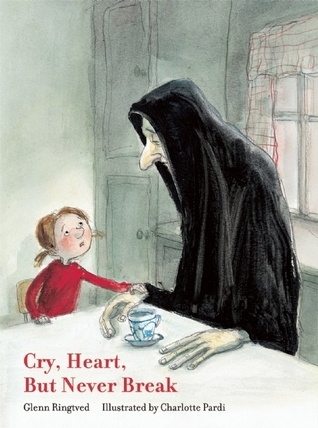 It's never easy to have conversations about death in our classrooms, but I think this gentle and sweet book would reassure students. This book gives readers a more irreverent version of Death, but also a strong character who resists him. Grandy Thaxter enlists Death's help with her work on successive days -- the cleaning (including the windows), the laundry (including the making of lye soap), making dinner (including grinding the corn for mush), the dishes after dinner, and, the straw that breaks Death's back, the making of linen (of the piles of bundles of wet reeds, he learns "We're going to brake it and swingle the reeds to get the flax"... "We're going to hackle it and spin it"... "So I can weave it into cloth."). Death can't take any more, saying, "I will come back some time when you are not so busy." Gotta love a woman who is just too busy to die! Thanks for sharing! I was captured by the illustration and wanted to read more. Adding these two books to my TBR list.